Minutes to make, using a handful of ingredients, Asian Lettuce Wraps are cinch to pull together – they literally take minutes. 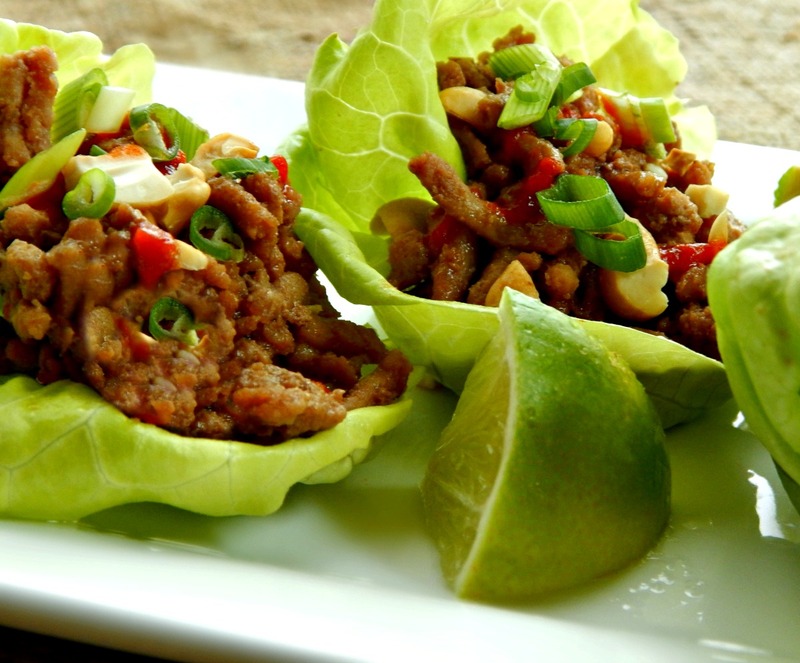 Make them once and you’ll be wondering why you’ve never made lettuce wraps before. And if you’re like me, you’ll probably start to tinker and add a bit of this or a bit of that, all your fave veggies, etc. and customize to your heat level. 1st is quality – you don’t always know how a ground product has been handled or exactly what parts are in those shiny little tubes. 2nd is price – whether turkey or chicken, in my area the low is between 69 cents to 99 cents a pound, respectively. 3rd is texture – sometimes those tubes contain mush – it’s hard to make that look attractive and the texture can be off-putting. I do get that sometimes you can get ground turkey or chicken from the butcher and not just from a tube, but it takes so little effort to grind up your own. Just cube up chicken or turkey and toss a good handful of the cubes at a time into a food processor. Pulse a few times and you’re set in minutes. For heat as desired: chili garlic sauce, sriracha, peppers in oil, etc. In a large pan, brown the ground chicken or turkey over medium-high heat, breaking up the pieces. If very lean, you may need to add a little oil. Drain, if necessary. Add scallions, garlic, water chestnuts, red pepper and cook a few minutes until the vegetables are softened. In a small bowl, mix together soy sauce, hoisin sauce, ginger, fish sauce and sesame oil and what ever you desire to add a little heat. Add to pan and stir until ingredients are coated and the sauce is thick enough to cling to the turkey/chicken and vegetables. Add the lime juice. Garnish with peanuts. To serve, spoon about ⅓ cup of chicken filling onto one lettuce leaf and roll it up, if desired. Serve with lime and sriracha or other spicy condiment, if desired. This entry was posted in Click here for Bargain Meals, Click here for Fabulous Food Posts and tagged Asian, Bell Peppers, Green Onion, Ground Chicken or Turkey, Lettuce, Lime, Nuts and Seeds, peanuts, water chestnuts. Bookmark the permalink. I’m so glad everyone liked them. We kind of did the same thing here, just scarfed it all down. I’m glad I happened to check my FB when I did, too! Thanks!! I didn’t know that about water chestnuts, I enjoy their crunch but thought they were like cucumbers…not a lot of nutrients. These look wonderful. Hi Liz – oh my it’s been awhile since I stopped by to see what you’ve been up to! I’ll be there shortly! The wraps were really good – so hard to believe it because they were so simple! Oh my! This looks delicious! I am hungry now and I am wishing I could enjoy this right now! 😀 Thanks for sharing at Fiesta Friday party, Mollie. You’re right Mollie– this is summer perfect! fast enough and simple enough on a hot day when the last thing you want to do is make dinner! Love the variety on your blog– always something new! thanks! hugs hugs! Yummy! I need to eat more like this! What plugin are you using for nutritional info? I know a couple apps that do but I don’t want to pay. Spending too much on this blog already and feeling discouraged. It’s so easy to get discouraged; I’ve been there, believe me. And I still do to myself that from time to time! My fitness pal is free and it’s easy; sometimes you have to copy and paste the recipe, but usually you go to food, then recipes and put in the url of your blog post, then when I have the nutrition in right, go back to the post and edit and add it in. I read this post and commented on it. I started my blog also as a way to work from home. So far, I’ve only spent money in this blog! I just finally bought a DSLR. I hope I can do well some day. I feel like I have potential in the 9 mo I’ve been blogging. Glad I have someone to support me. It means so much! Thanks Mollie! I’m STILL waiting for summer in my neck of the woods, but I do hear it may appear on Saturday, lol! I’ll keep this in mind when it finally gets here, yum! That looks so delicious. I really should have my dad and brother grind up a bunch of turkey or chicken for me sometime when they are processing meat and vacuum packing anyway. Then I could have a bunch in the freezer for when I need it! Made a similar version Saturday. Your brother could not get enough. Healthier options!!! Thanks! Waterchestnuts are funny; people dismiss them because they’re so light but they pack in a lot of nutrients.